WELLESLEY, MA--(Marketwired - December 17, 2015) - Allurion Technologies announced today that its Elipse™ Gastric Balloon has received a CE mark allowing sale of the product in the European Union. This is the company's first regulatory approval. Elipse™ will initially be available in select leading weight loss centers in France, Italy and the United Kingdom. Elipse™ is not yet approved by the FDA and is not available for sale in the United States. Dr. Shantanu Gaur, Allurion's Co-Founder and Chief Scientific Officer, said that "excess weight often has a profound impact on health and quality of life including work, relationships and self-perception." However, of the nearly 2 billion overweight and obese adults worldwide, less than one percent have embraced currently available surgical and endoscopic options. Gaur continued, "weight loss therapies that require surgery, endoscopy, or anesthesia are often too invasive and can be too expensive for people who might otherwise greatly benefit from them." "Our procedureless gastric balloon offers a simple, safe and effective alternative," said Dr. Samuel Levy, Allurion's Co-Founder and President. "Elipse™ is a new way for overweight and obese individuals to take action." Elipse™ is Allurion's flagship product and is the world's first procedureless gastric balloon. Elipse™ is made of thin, flexible polymer film and is delivered in a swallowable capsule, eliminating the need for surgery, endoscopy or anesthesia. It remains in the stomach for four months, after which it automatically empties and is excreted naturally. Elipse™ will be provided by licensed physicians as part of a comprehensive weight loss program. Allurion has studied Elipse™ in individuals with a Body Mass Index (BMI) between 27 and 40 to assess its safety and its effects on body weight, metabolic parameters and quality of life. Interim results from a clinical study in 34 individuals were presented recently at ObesityWeek, the annual conference of the American Society for Metabolic and Bariatric Surgery and The Obesity Society. Findings included an average weight loss of 10 kilograms (22 pounds), with participants losing 37 percent of their excess weight and eight centimeters off their waist circumference over the four month treatment period. Participants also saw improvements in their triglycerides, hemoglobin A1c (HbA1c) and all aspects of quality of life. All balloons were safely and naturally excreted. "Following six years of development, we are very excited to enter the next phase of our company's growth," said Jonathan Wecker, Allurion Technologies' Chief Executive Officer. "I am extremely proud of our team and thankful for the support of the many physicians and allied caregivers that have helped make Elipse™ a reality. Following initial release in Europe, we expect to offer Elipse™ in the Middle East and beyond in the months and years to come." 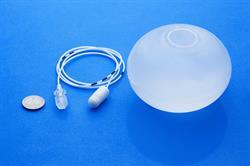 Elipse™ is a procedureless gastric balloon that is placed without surgery, endoscopy or anesthesia. It will be offered by physicians in conjunction with a medically supervised diet and exercise program. The device is swallowed in a capsule and filled with liquid through a thin delivery catheter, which is then detached. Elipse™ remains in the stomach for four months after which the balloon opens, allowing it to empty and pass naturally from the body. Learn more and see an animation of Elipse™ in action here. Founded in 2009 by two Harvard Medical School students, Allurion Technologies is dedicated to developing less invasive treatments for overweight and obese individuals. The company's flagship product, Elipse™, is a procedureless gastric balloon that works by filling the stomach, slowing digestion, and enabling portion reduction. Allurion is funded by private investors and the Massachusetts Life Sciences Center. Learn more about Elipse™ and Allurion online at www.allurion.com or on Twitter @alluriontech. An animation describing Elipse therapy. The Elipse capsule and balloon are shown next to a US quarter for size comparison.